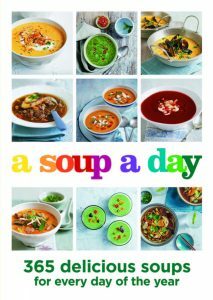 “A Soup A Day: 365 delicious soups for every day of the year.” Octopus Publishing Group, $9.99. About a week ago, a co-worker spotted “A Soup A Day: 365 Delicious Soups” on my desk and scoffed. “It’s too early for soup,” he said. Although that would never be a sentiment of mine, I don’t think anyone would agree with it now. Seemingly out of nowhere, soup weather arrived, and that’s good news for anyone who appreciates a comforting meal that’s often easy to make and usually not too high in calories – at least for how filling it is. And this cookbook has every soup lover covered with recipes ranging from borscht to bouillabaisse and some more unusual varieties in between. There’s a chilled spinach, kiwi and chia seed soup, presumably for summer days, and a Thanksgiving turkey, pumpkin and cranberry one that could come in handy soon. Others span the continents: Jamaican pepperpot, Moroccan mint, Malaysian laska and Scottish cullen skink. Each recipe is assigned a number, but there’s no apparent order, at least that I could decode. It seems roast root vegetable (No. 202) wouldn’t be so close to summer green pea (No. 208), if the book were following the calendar, as the title implies it might. But that also makes it more fun to flip through and offers the freedom to make any of the recipes at any time of year. There’s a lot packed into this travel guide-sized volume, with multiple recipes to a page and mostly small, close-up pictures to go with fewer than half of them. Many of the recipes are followed by a slight variation for “next time,” with suggestions for how to tweak the ingredients or cooking instructions for a different soup. Roasted celery soup can be chilled and served with candied pumpkin seeds. The poultry in chicken and tarragon soup with puff pastry can be substituted with cod. Some unusual phrasing, ingredients and measurements throughout, I imagine, are a result of this cookbook being British. It instructs to bring soups “to the boil,” calls for cockles and courgettes, and lists ingredients in grams and pints. But aside from these quirks, it does everything I believe a good soup reference book should do: cover all the common varieties, represent many cuisines and offer some unique recipes. In my flipping through, I was pleased to find several soups that used fennel as a main ingredient. I’ve been on a fennel kick, mostly shaved in salads, but often have some I need to use up. I chose the simplest recipe: velvety fennel and Parmesan soup, which called for sautéeing (here, “frying”) roughly chopped fennel with spring onions and diced potato, adding stock and Parmesan and pureeing it. Like many of the pureed soups that call for a garnish (the fennel and lemon soup is topped with black olive gremolata, smooth spinach and kale soup is served with Brie toasts), this recipe included instructions for Parmesan wafers (grate Parm, arrange in circles in pan, bake) that are meant to be broken up and scattered on top. 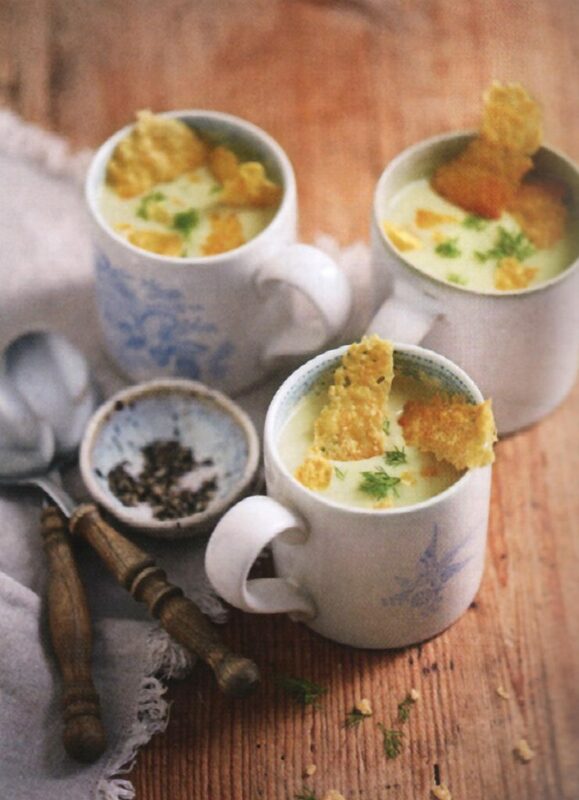 Along with the fennel fronds, they made an easy way to add some sophistication and flavor to the simple soup. I definitely plan to whip these up again and trick someone into thinking I’m a fancy chef. I have a feeling a lot of these recipes could do the same for me without my having to actually be one. Melt the butter with the oil in a saucepan, add the spring onions, fennel and potato and fry over a medium hear for 5 minutes, stirring, until softened but not browned. Pour in the stock and bring to the boil. Coarsely grate 50 grams (2 ounces) of the Parmesan and reserve, then add the remaining Parmesan and rind to the pan. Season with a little salt and pepper, cover and simmer 25 minutes. Meanwhile, line a baking sheet with nonstick baking paper, arrange the grated Parmesan into 6 well-spaced mounds on it, then spread each into a roughly shaped circle about 7.5 centimeters (3 inches) in diameter. Bake in a preheated oven, 200 degrees C (400 degrees F), Gas Mark 6, for 5-6 minutes until bubbling and golden brown. Leave to cool on the paper. Lift the Parmesan rind out of soup with a slotted spoon, cut away any soft cheese and return to the pan, discarding the rind. Leave the soup to cool slightly, then puree in the pan with a stick blender or in batches in a blender or food processor until smooth, returning to the pan. Reheat, then taste and adjust the seasoning if needed. Pour the soup into cups, garnish with any reserved snipped green fennel fronds and serve each with a Parmesan wafer, breaking it into pieces and scattering over the top of the soup, if liked.